Learning about personalities can be a huge key in getting along. It’s one key that is easily overlooked during the beginning of our marriages. Most of us fell in love with our man, not because we thought his personality was a perfect fit with ours. But because we like his personality, he was a hottie and met our needs during dating. 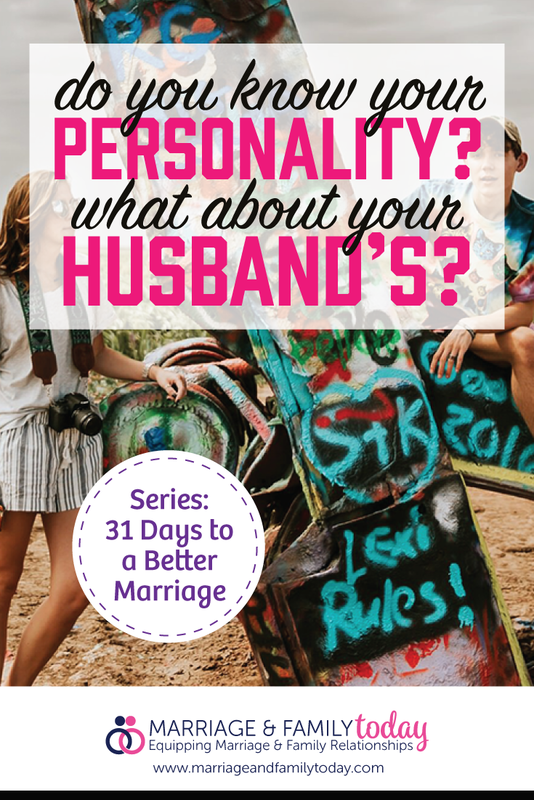 After marriage, we begin to realize that our personalities may not line up with each other. They may not interact or get along very well together. There are probably lots of arguments and disagreements. Most of the times, no one has taught us how to manage to live with someone else that act and thinks differently than we do. We grew up in our homes where our personalities were not always allowed to shine! We were told to behave and that’s about it. Now you are living with this other person that is completely different than you in so many ways. We were all created uniquely! Can you imagine if we were all the same? Yikes! It would be a very boring, uncreative and unproductive world. You and your husband were meant to be together. Your personalities and unique qualities were put together to help each other. Where he is weak you are strong and where you are weak he is there to pick you up. Embrace your differences and learn how to use them together to make your relationship stand strong and solid. There is nothing better than a married couple together together, conquering the world and making it through this thing called life, with each other. We will briefly go through each of the 4 primary personalities. There is so much to learn about them, you can take our full course on Personalities (coming soon) and take the personality assessment where you can identify your personality. Everyone has a primary personalities and a secondary personalities. You will also find little bits of the other two mixed in as well. Again, not one of us is alike, and while we may have similar personalities, no two are exact. By reading the descriptions below, you will most likely recognize yourself in one or two of these. You should also be able to recognize your husband as well. You will see where some of your differences are and that it is ok that you have those differences. The first step is learning to accept each other the way you were created and the fact that you do things differently and see the world in unique ways. This personalities basic desire is to have control. Weaknesses: Bossy, Proud, Headstrong, Intolerant, Manipulative, Impatient, Inflexible, Doesn’t like mistakes, Dominates others, Decides for others. This personalities basic desire is to have fun! This personalities basic desire it to have peace. Strengths: Low-key, Everybody’s best friend, Quiet but witty, Not in a hurry, Mediates problems, Avoids conflict, Good listener, Competent and steady, Good under pressure, Compassionate. This personalities basic desire is to have perfection. Strengths: Deep and thoughtful, Organized and detailed, Neat and tidy, Schedule oriented, Faithful and devoted, Artistic or musical, Sensitive to others, Makes friends cautiously. Weaknesses: Resentful, Hard to please, Pessimistic, Too sensitive, Suspicious, Unforgiving, Low self-image, Guilt feelings, Hypochondriac tendencies, Not people-oriented, Hesitant to start projects. Learn what your personality is first. Then try to pinpoint your husband’s. After realizing the differences, try to accept the way he does things and how he thinks. Give him grace for his uniqueness and find new ways to let him shine through his personality. What Are Your Husband's Emotional Needs?